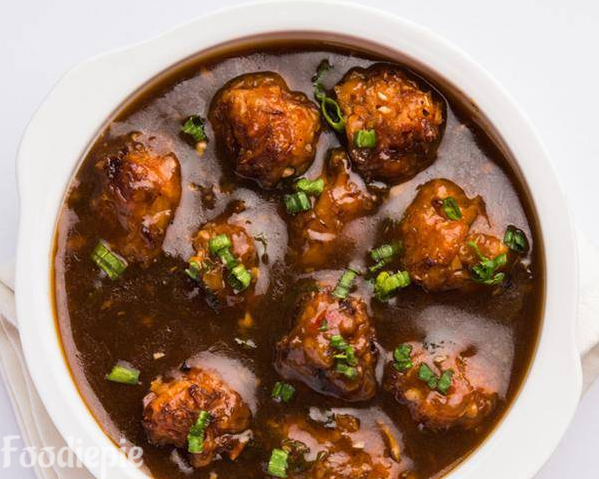 Vegetable Gravy Manchurian - is an easy Chinese recipe.This delicious gravy is ready with cabbage, carrot and corn starch. Manchurian recipe tastes best when served with fried rice or Veg Hakka noodles.This Chinese dish makes a good main course dish, however, you can prepare this dish as a starter, you only have to add the minimum water so that the Manchurian balls are juicy.When making the Manchurian balls, you can add corn flour if it becomes difficult to fill together to make small Manchurian balls. Simply cool the Manchurian balls for a few hours from frying. So the next time, if you want to prepare something tasty and graceful, then try this vegetable Manchurian and like the taste of this Chinese dish with your loved ones.Let's Checkout Recipe. Step 1 : First of all grate all the vegetables Cabbage,carrots,capsicum and add chopped green coriander. Step 2 : Now add corn starch ,chopped green chilies,black pepper powder,soy sauce,Ajinomoto and salt in grated Veggies.Mix all well.When all mixture is mix well then take a little mixture and prepare small size balls or according to you. Step 3 : Heat oil in a pan and Fry all prepared Manchurian balls. (If balls are broken while frying then add 1/2 teaspoon corn starch in mixture mix well then fry).Fry all the ball until turns golden brown. Step 4 : Now prepare Manchurian Sauce Add 2 tablespoon corn starch in 1 cup water and make thin paste.Avoid lumps. Step 6 : Add 2 cup of water,black pepper,vinegar,ajinomoto and salt.Allow the mixture to boil.Boil for 9/10 minutes. Step 7 : Now add corn starch mixture in it which we prepare in 4th step.Keep boiling for 2 minutes again. Step 8 : When Gravy is thicker or ready then add fried balls in gravy and cook for 5 minutes over medium flame.